All-In Night is a family routine. For one night of the week everyone stays home. By spending ten to twenty minutes together, you can learn and talk about the things that matter. The book includes 40 weeks of activities, designed as 1 per week of the school year. Activities include love languages, listening for God, self-esteem, the fruits of the spirit and many more. These fun and simple family activities provide an opportunity to grow values, goals, hopes, feelings and the foundation for a Christ led life. All-in Night works with two kids or ten. Let it become the heart of your family's life. "Lynne and Chris Burgess have done two great things. They have raised a large family rather well, and they have found a simple family ritual which helps parents to proactively teach and learn with their children about the things that matter. In an age when most families let the consumer culture roll over them, Lynne and Chris took a stand and figured out how to give their kids confidence, dreams, and a place to be themselves. They claimed back one bit of the week to really be a family, to listen, share and appreciate. The results can be repeated by anyone with a bit of gumption and a desire to connect with their children and keep that connection for life." "This book is an inspiration demonstrating how important family life is, it is important to give your family roots and wings. Warmest congratulations on having written such a spendid book about your family night." All-In Night is a family ritual, one night of the week where everyone stays home and for just ten-twenty minutes, learn and talk together about the things that matter.You can do it with two kids or ten, but this will become the heart of your family's life.Values, goals, hopes, feelings, in other words, a well lived life - will grow through being proactively addressed in these fun and simple family activities.And the beauty of it is, ANYONE can do it! Lynne and Chris have raised five children who are now adults. Lynne's practical experience comes from the quality time spent with her own children. She successfully implemented her All-In Night for over 16 years using simple yet productive activities that included the whole family. She now shares these ideas at speaking events and through her book. 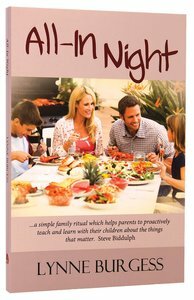 Customer Reviews For "All-In Night"
Promoting family togetherness and staying close is important to me but as my children's ages are fairly wide apart, I wondered how we could achieve this over the years. Lynne Burgess' book has opened my eyes that not only is it possible but is also easy, fun, doesn't take much time and only a little bit of planning, and she has already started us off with the first 40 ideas. Good on her for putting this together to benefit families everywhere.